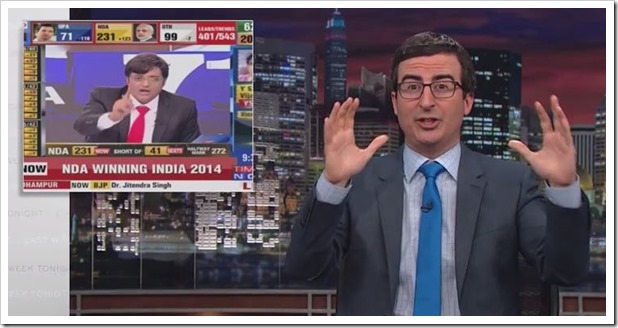 #Humour John Oliver At It Again, Makes Mockery Of TV Coverage Of Indian Elections! John Oliver, the British comedian who recently started his weekly show called “Last Week Tonight With John Oliver” is at it again. His debut show which was aired few weeks back, showed (humorously) how Americans view (or don’t view) Indian elections. The hilarious 8 minute video released couple of weeks back had John Oliver ranting about how this elections are completely ignored by American media and gives a reference to a elderly gentleman saying “What does Indian elections have to do with United States, it should not concern us even a bit, as they are not even in our hemisphere”! Now that the elections are over, he has some advice to our News Channels on how they covered the elections as well. He makes fun of incessant graphics and confusing numbers shown at the time of live coverage of Indian elections. And like in the case of previous video, his favorite whipping boy seems to be Arnab Goswami, because even in this short video, John does not forget Arnab’s theatrics. Check out the video that was aired on HBO on Sunday night. On a serious note, in defense of Indian news channels, Elections in India are not as simple. Unlike in the USA, where only 2 parties compete and have only 2 presidential candidates, Indian elections are as diverse and fragmented as they get. To show deluge of information and numbers, news channels have to resort to programming where as much information possible has to be crammed in. Irrespective of that, do watch the video and have some fun! BJP’s Election Manifesto – Whats In Store For Businesses & Entrepreneurs? Loved this video. What a great observation on Indian media – Atleast NDTV (Pranab & Team) did a great job at the election results – TimesNow was a disaster and don’t even get me started on Aaj Tak and others. Also, would like to share some more humor of these elections which I came across. Hope you will enjoy it too! !